Now owned by Irving Shipbuilding, the large dry dock was constructed in the 1880s for shipbuilding and repairs. It has functioned during two World Wars and is still serving the industry today. According to the CSCE’s Program of Designation, the 173-metre-long and 24-metre-wide graving dock is a remarkable engineering accomplishment: at 125 years old it is still performing, essentially according to its original design. At the time of its construction, it was the largest dry dock on the Eastern Seaboard and could handle the world’s largest vessels. The Graving Dock remains a critical part of Shipbuilding operations. The Dock has survived the Halifax Explosion, several World Wars, and the inevitable advancement of the industry from wooden to steel ships as well as the exponential growth in vessel size and weight. It helped repair several thousand ships during World War II and now is the repair site for the Canadian Navy’s current combatant fleet. 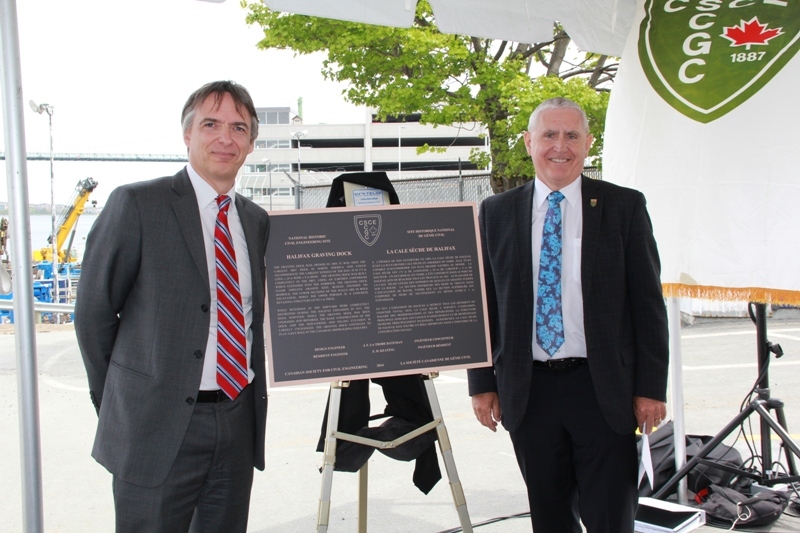 Peter Williams (left), Vice President of Commercial & Industrial Business at Irving Shipbuilding, accepts a plaque presented by Reg Andres, P.Eng., President, Canadian Society for Civil Engineering, officially designating the Halifax Shipyard Graving Dock as a National Historic Civil Engineering Site.